Xtend2 - What's In The Pipeline? In the last weeks, the Xtext team has been busy with creating Xtend2. Xtend2 is the successor for Xtend and Xpand and implemented on top of Xbase1. I think we made really great progress both within Xbase - which is a reusable expression language that can be embedded into any language that is developed with Xtext - and with Xtend2 itself. Xtend2 provides some unique language features and great Eclipse based tooling. It's really a pleasure to see how the well choosen orthogonal concepts interact with each other and how their total creates a language that feels as fantastic as Sven predicted. The extension concept of Xtend2 allows to import extension methods in a static and in a dynamic manner. Dynamically imported extensions are injected into your instances by means of dependency injection. It is really straight forward to create a customizable and adoptable code generator simply be using well defined components that are assembled by a DI container such as Google Guice. Polymorphic dispatching allows to invoke overloaded methods according to the runtime type of their arguments instead of a static decision. This is especially useful if you want to process heterogenous data structures such as EMF models. It is even possible to rely on this runtime binding when you use Xtend2 classes from Java code. Even though Xtend2 compiles to java code which is not dependent on JDK7 (or later), we provide full support for closures. Writing own higher order functions that take closures as arguments or return function types is possible, too. Type inference works for expression trees and across method boundaries. 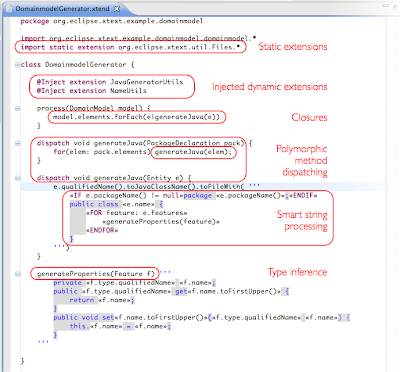 It is usually not necessary to define the type of closure parameters, local variables or the return type of methods since the type system will derive it automagically. It works great with generics, too. Xtend2's rich strings allow to write code generator easily. We came up with a neat solution for the classical whitespace problem in template languages. The IDE support that includes validation of template indentation, quick fixes and semantic highlighting helps to write code generators or compilers in a readable way while the output looks nice, too. While we're at IDE support, did I mention the refactoring capabilities, content assist, hover information or the other features that are available in the Xtend2 editor because? If you are at EclipseCon and as eager to get your hands dirty with Xtend2 as I am, make sure to attend the tutorial that Jan, Sven and I will give there. The Xbase development is sponsored by itemis and the Federal Ministry of Education and Research.